A few months ago I strolled into Sephora with a friend with no intention of finding anything interesting. It always starts out that way, doesn't it? I've been very impressed with Sephora's Formula X line, so I decided to take a glance at it assuming they didn't have anything new to entice me. Wrong. They had a new collection called Black Quartz. This collection consisted of 5 colors that were black jelly bases with jewel-toned glitters. As soon as I saw these I knew I was screwed. Oh, so very screwed. I resisted though, because these puppies are not cheap. They're $12.50 a pop. Instead, I put these on my Elfster wishlist in hopes that future gift exchange buddy may get them for me. I was in luck, as my Secret Santa did gift me 2 of these polishes over the holidays! I have the color Bliss to show you today. Color: This is gorgeous! 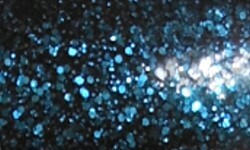 I love the bright jewel-toned glitter popping out against the black base. This color is rich and vibrant. I don't really have much else to add. Formula: The formula on this was good. It wasn't as good as some indie glitters or jelly glitters out there, but it was good. I didn't have any problems with application. I used 3 coats above. Top coat is a must on these as these dry very dull and matte. Price: This is $12.50 at Sephora or Sephora's website. Overall: I'm pleased with this nail polish. I don't know of anything like it out there now. It's unique to me and it's awesome it's widely available. I love the glitter against the black base. The formula is good, not amazing, but I'm not going to complain about that. The price is a bit to swallow, but it is Sephora. Bliss is a-OK with me!